Los Angeles, CA - (June 2012):Magnetic nail art took the beauty world by storm earlier this year, creating anail art force that was hard for anyone to resist. Following the phenomenal success of its first-generation Magnetix collection, ChinaGlaze® introduces Magnetix II,an expanded second collection of magnetic nail lacquers. 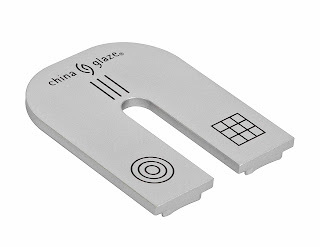 Along with the new shade line up, China Glaze® has created a second, specially designed magnet featuring three additional unique designs – a swirling circle, vertical lines and an intricate lattice. The separate magnet allows more design options, especially when coupled with the original China Glaze® Magnetix Magnet. Alternate designs, rotate the magnet,play with the positioning on the nail – the art creations are endless! 2. Apply one coat of China Glaze® Strong Adhesion Base Coat to clean nails; allow to dry completely. 4. Once the design is fully developed and nails are dry, seal with China Glaze®Fast Forward Top Coat. 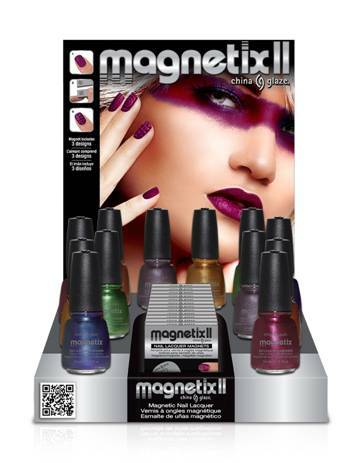 ChinaGlaze® Magnetix II will beavailable September 2012 at salons and beauty supply stores nationwide withpolishes and magnet sold separately. The collectionwill be available in a 12-piece counter display and as open stock colors and magnet. ChinaGlaze® is free of DBP, toluene, and added formaldehyde. For moreinformation, visit www.chinaglaze.com, follow China Glaze® on Facebook (@ChinaGlazeOfficial) and Twitter(@ChinaGlaze) and check out China Glaze® YouTube channel, www.youtube.com/ChinaGlazeOfficial. ChinaGlaze® is a division of American International Industries. For nearly 42 years, AII has been the leading manufacturer and worldwide distributor of innovative, quality beauty and skin care products for men andwomen. Our product lines include Ardell, Andrea, Body Drench, Bye ByeBlemish, Checi, China Glaze, Clean + Easy, Clubman/Pinaud, Duo, EuropeanSecrets, EzFlow, Fright Night, Gena, GiGi, Gypsy Lash, IBD, It’s So Easy,Jeris-Lustray, Nail Tek, No Tweeze/Micro Tweeze, 'N Rage, Poshe, Prolinc, RAW,Seche, SuperNail, Surgi-Care, Waterworks, Winning Nails, Woltra,Woody’s, and Youthair. For more information, visit our website: www.aiibeauty.com. Kind of surprised that ChG is going fwd with another magnetics polish release - the last one did not sell all that well. This trend is sort of getting burnt out. Seems I always see shades in the same ranges for magnetics - thinking there is something needed in the formulation that limits us from getting say any lighter shades...will be curious to see if this gold here is really as light as the graphic makes it appear - my guess is not. Mweh, not a fan of magnetics!